According to Ventures Africa Nigeria architect, designer and ‘urbanist’, Kunle Adeyemi of NLÉ in partnership with the Heinrich Boell Stiftung, has proposed plans to build a three-story school out of 16 floating platforms lashed together, capable of holding 100 students and teachers, in the waterfront slum of Makoko, area of Yaba, Lagos. Makoko, where shacks stand above the murky, fetid water on stilts of cast-aside lumber, is visible to motorists plying the city’s Third Mainland Bridge each day on the way to the Lagos’ commercial hub – Victoria Island. 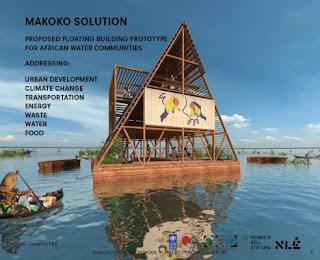 The proposition is part of NLÉ’s plan to develop an improved type of architecture and urbanism for water settlements in African coastal cities, starting with the building a prototype of a Floating School in Makoko. The school is expected to serve the urgent needs of educating children in the community. The prototype floating building will be modular, flexible and adaptable for other building typologies: homes, community centres, playgrounds – to gradually cultivate an improved quality of architecture, urbanism and living on water. A ‘floating’ building simultaneously addresses different issues including flooding, land occupation, and foundation construction. The energy supply is based on renewable energy technology while the currently inexisting sewage system would rely on compost toilets. If successful, the project could be transformed into homes for more than 100,000 people who live in the slum.